Bath — Pedigo Construction Group, LLC. This particular client had a typical outdated Plano bathroom and was looking for a remodel that gave them a unique modern feel. We designed their bathroom with materials and features that would clearly stand apart from other updated bathrooms while keeping the same floorplan and meeting their budgetary requirements. The three dimensional water like wall tiles, the floating cabinets with LED under lighting, a low profile shower pan and carbonic radiant floor heater under the Travertine floors are a few examples of the elements that make this bathroom truly unique as well as very functional. This client bought a home in North Dallas that had a home office attached to the guest bedroom. She didn’t need the office and wanted to add a guest bath complete with walk in shower. This was a difficult project because the nearest plumbing was 60’ away on the other side of the house. The shower and floors are finished out with porcelain tile that looks like Marble. 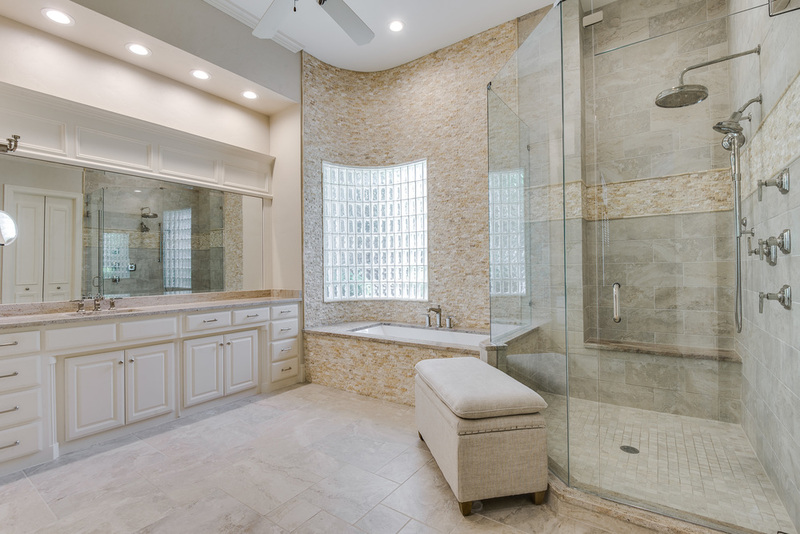 We installed custom cabinetry that matched the existing kitchen cabinets and frameless shower enclosure to ensure the quality was befitting the rest of the house.